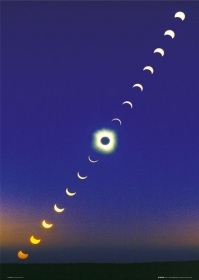 This solar eclipse is an annular eclipse. It is almost a total eclipse except for the moon not quite filling up all the space. This will give the appearance of a ring of fire around the moon's eclipse of the sun. Viewers of the eclipse must wear highly protective eyewear if planning on watching the eclipse. Do a google search of ways to view the solar eclipse safely. From the astrological perspective, the chart for the eclipse is still pushing us to transform our definitions of authority, power and even our careers. The T-square from Pluto in Capricorn to Mars and Uranus in Aries, along with Jupiter in Libra has us struggling to comprehend what we are doing to ourselves. How did we get here? Well, Uranus loves chaos, Mars likes to pick a fight, and Jupiter loves to expand on WhatEver is going on, while Pluto forces us to rethink and regroup, or lose it all. The new moon's conjunction of the Sun and Moon in Pisces pulls in Neptune to the mix, and it can cause feelings of insecurity. Do we hide and wait it out? Do we try to find someone to explain it for us? Do we create a fantasy to explain away the problem? Each of us will find our own path for our situations. We may tell ourselves that we are helping others to better understand. We may want to believe that we are saving the world or fixing others' problems. The key for this eclipse is to try not to be so blasted gullible. We may not be seeing the whole picture. We may only be seeing what we are permitted to see, or choosing to see. This can be a time that requires our flexibility, but also our openness to gathering unusual information and opinions without judgment. If the information is overloading, then sleep on it, a night or two, before reaching a conclusion. Don't be afraid to do the research in areas that we would normally shy away from. If we discover that we bought into a fake deal, then what are we willing to do to undo that fakery? Mercury has moved into Pisces and our way of thinking is now adjusting from the eclectic free-for-all that we sometimes got into while Mercury was transiting through Aquarius. Now we are trying to merge the information to make better decisions. People will sometimes try to fake us out by using words that socially mean one thing, but in their clique, these words take on a different meaning. This is sometimes referred to as the unique nomenclature of an institution. This strategy is used to "sound" conforming to others, but has it's own subclass of meaning for a select group. We can use the influence of Pisces, while Mercury transits, to help us get a better understanding of the sub-culture lingo. Venus in Aries is helping us to develop some insight as to the process of the Chaos that Uranus keeps stirring. Mars and Uranus in Aries is forming a trine to Saturn in Sagittarius, while Saturn is sextile to Jupiter in Libra. We may need to step outside of our impulsive opinions to redefine our attitudes. We don't need to be combative in order to create change. Our actions of today are already changing how others will treat us in the future. This eclipse is from the solar saros 140 series that lasts approximately 1263 years. The series originated on April 16, 1512 [calendar corrects to April 26, 1512] and the last eclipse of the series will end in 2774. This particular series is associated with the 19th nodal family of eclipses originating from the southern hemisphere. When Rose Lineman wrote the "Eclipse Interpretation Manual" in 1986, she had not yet been able to discern which series the 19S was being associated with. We now know that this series originated at the 5th degree of Taurus, ruled by Venus, sub-ruled by the Moon (third duad) and also sub-ruled by Venus (first decan). This adds a theme of endurance and persistence, as well as undercurrents of intuition and connection to the originating eclipse chart, that carries over into all subsequent eclipses of Saros 140. One similarity that we can see between the two charts is Uranus transiting in Aries in the originating chart. Saturn was in Libra whereas Jupiter is currently in Libra. Mars was in Sagittarius, while Saturn is currently at the same degree of Sagittarius. The two charts reflect a Bowl of planetary placements with the preponderance of planets filling the southern half of the charts (Libra through Aries). The significance of the bowl chart is that people tend to be pushy, are fully aware of being pushy, in an attempt to get their own way. 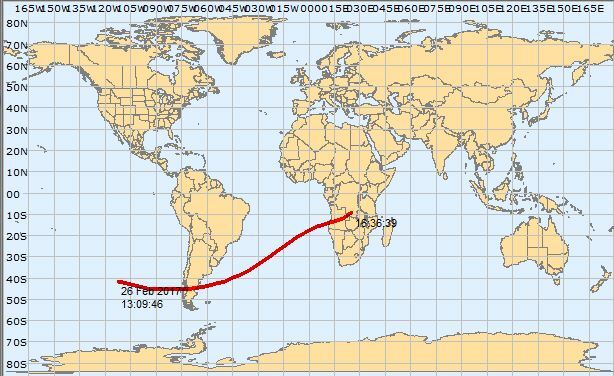 This year's eclipse will initiate over the South Pacific, moving over Chile and Argentina, moving across the southern portion of the Atlantic and then the southern portion of Africa. Overall, this eclipse chart will feel like a teeter-totter, as we try to balance the fact that is an unbalanced number of elements. There is only one earth sign placement and only one air sign placement. While this balances us as far as power and authority, what we lack is some of our usual intellectual awareness along with our ability to stand firmly in our beliefs. In other words, we may not be feeling what others are feeling, and we may not be truly listening to what others are saying. We may push forward without having a full awareness of what we are walking into. Once we get into a situation that overwhelms us, we may find ourselves feeling as though we are drowning in too much Something. That something could be too much information or it could be too much emotion or even too much authority. Each of us will need to find ways to cope in ways that feel foreign. The chart is totally missing the Fixed quality and we are expected to deal with whatever gets thrown our way and answer for it, in the process. Our desire to quickly respond and resolve, may get us into more hot water. We may be attempting to rely on our instincts. But that may turn out to be unreliable for the situation. The key to this chart is in the influence of Pisces. Don't focus so much on our own needs despite the urge to want to look inward. Instead, look outward at how others need our assistance at this time. Reach out in empathy and compassion to help others in need. Awakening others carries tremendous responsibilities.